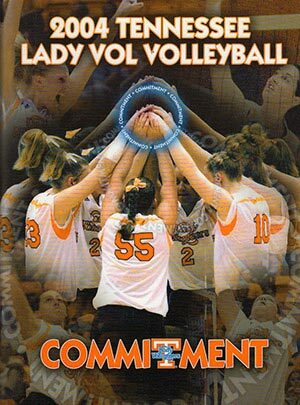 This season marks the tenth anniversary of a Tennessee volleyball team that reached heights unknown up to that point in program history, and paved the way for future Lady Vol squads to come. Head coach Rob Patrick had been steadily building up the program since taking on the job. After being hired the summer before the season started in 1997, his first team went 15-19. But things were all uphill after that. In 2003, the Lady Vols had an impressive 22-9 record — just the second season with single-digit losses in school history and the first since 1982. (Three of those nine losses came to eventual national runner-up Florida; two others came in 3-2 squeakers vs the Big Ten’s Michigan and Michigan State.) It was also the team’s third 20 win season in four years. Despite their record, a school high 10 conference wins, a 11-2 out-of-conference record, including victories over the ACC and Big South Conference champions, the Lady Vols weren’t invited to the NCAA Tournament. Going into 2004, Tennessee had some big expectations for themselves… and maybe a chip on their shoulders as well. And they were well placed to achieve their goals. Players accounting for 95% of the previous seasons kills, assists, aces, digs, and blocks were back — including all six starters. The rest of the conference took note: the Lady Vols were picked to come in second after Florida by the SEC coaches. The Lady Vols started off what would be an historic campaign inauspiciously in Los Angeles, losing their first set of the season to Villanova before bouncing back to win the match. They took down Duke in three the next day. That night they faced their first big test of the year: #18 Loyola Marymount on their home court. Tennessee responded with a sweep — at the time just the second 3-0 win vs a ranked team in school history. UT returned to Knoxville the next week for the Lady Vol Classic, where they kept up their sweep streak with wins vs Wake Forest and UT Martin. Then they faced their second ranked opponent of the year in #24 Purdue. Led by a furious blocking performance, the squad got a 3-1 victory. The team earned their first ranking in the USA Today/CSTV Coaches Poll in 19 years, debuting at #22. Next up for the team was a win over fellow Tennessee program Libscomb and then a trip to Michigan. They dispatched Western Michigan and Virginia Tech. Then the now 9-0 Lady Vols had to face the 8-1 home-standing Michigan team, who had just lost their first match of the year to WMU. The Wolverines gave Tennessee their first loss of the season in four. Down to #24 in the polls, the team went back to Knoxville to face another tough out-of-conference foe, #15 Louisville. This would be the first time in 19 years UT played in a match where both they and their opponent was ranked. And the Lady Vols did not disappoint the home crowd, getting a 3-1 upset over the Cardinals. UT started off the SEC portion of their schedule in impressive style: sweeping their first six opponents, which still stands as the single season school record. With two more 3-1 victories, the Lady Vols were 8-0 in conference play and ranked #17 when #8 Florida came to town. The Gators had won their last 138 regular-season SEC games, dating back almost a decade! Tennessee went all out to hype up the televised game and get as many fans in the seats as possible — including having a $500 contest to see which campus organization could have the most members in attendance, with coach Patrick promising to double the prize if total attendance reached 1,200. The Stokely-record 1,337 fans almost saw history, as UT came out hot winning the first set 30-26 and barely losing the second at 34-32. But Florida regrouped during the break and came out strong easily winning the last two sets. The team bounced back, winning their next six SEC matches and a non-conference game vs Appalachian State. With one regular season match remaining, UT already had an historic season: an unparalleled 25-2 overall record, a stunning 15-1 SEC record, a #15 national ranking (their highest since 1983). No matter what happened next, this squad’s legacy was secured. But what happened next put them into an even higher echelon in program history. Whoever put the 2004 conference schedule together unwittingly set things up perfectly. The last match of the season put #15 Tennessee, one game behind first place, against league leader #7 Florida. The Gators winning ways had continued since the last meeting. Now they had won 145 straight SEC regular season matches dating back ten years and a day exactly — an NCAA record. They had won 121 consecutive overall conference matches (including tournaments) since 1997 — an NCAA record. And this time the game would take place on UF’s home court where they had won a staggering 109 straight SEC matches dating back to 1990! If all that weren’t enough, the SEC title was also on the line. Florida had already won a share of their 14th championship in a row and was hoping to earn it outright with a final win. Tennessee came out strong, easily topping Florida 30-21 in the first set. 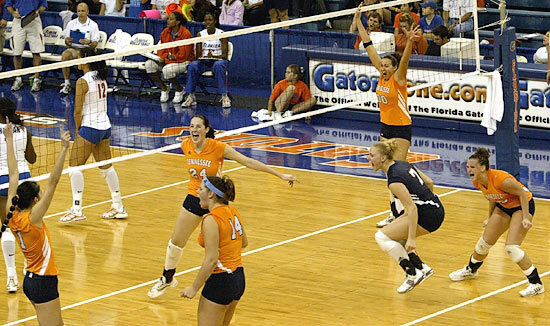 Florida regrouped and thrilled the home crowd by winning the next two sets 30-23 and 30-25. The fourth set looked to be going UT’s way as they led by seven points through most of the frame, with a commanding 26-19 score near the end. But the Gators roared back to tie things at 27. From there the teams traded points before the Lady Vols were able to scrounge out a 31-29 win. The home fans were about to see a fifth set in an SEC match for the first time since 1991. The deciding set started out much as the last had ended. Florida was eventually able to go up by two, earning a 9-7 advantage. But the Lady Vols fought back, winning the next six points, and eventually the set (15-12), and match. Tennessee not only ended the streaks and defeated a top ten team for the first time since 1983, they also won a share of the SEC Championship for the first time since 1984. They were ranked a program high 12th in the polls. Patrick won his first conference Coach of the Year award — the first time a UT coach had earned one since 1988. Amy Morris was named the SEC Defensive Player of the Year — the first time a Lady Vol had won one of the conference annual awards ever. And five players were named to the All-SEC teams. With the regular season out of the way, the team now prepared for the post-season, starting with the SEC Tournament. Despite their win over Florida, Tennessee was given the #2 seed due to the tiebreaker rules (though 1-1 in head-to-head matches, UF won their match in four sets, while UT won theirs in five). The team defeated Auburn in the first round 3-1, and Arkansas next by the same score. That set up a rematch vs #10 Florida in the finals. With the teams knotted up during the regular season matches, the conference tournament was now a tie-breaker of sorts. And once again, it was on Florida’s turf. After not losing a match to a conference foe in Gainesville for 13 years, the Gator fans didn’t want to see it happen twice in one week! But that’s exactly what happened. Florida took the first set 30-18, while Tennessee eked out the next two 30-27. While the home team dominated the fourth set 30-17, the Lady Vols dominated at the perfect time in the fifth to get a 15-5 victory. The win gave Tennessee their first SEC Tournament title since 1984. Amy Morris was named the tourney MVP and Julie Knytych joined her on the All-Tournament team. They now had a 29-2 record and had won eleven straight. And UT moved into the top ten of the poll for the first time ever. Even after all the firsts this group of young women had accomplished, they still weren’t done. First up was a quick out-of-conference sweep of Pittsburgh as a warmup for the NCAA Tournament, the program’s seventh overall but just the third in two decades. The team earned a #12 seed and first round hosting. In their opening match they faced Eastern Kentucky, and UT swept them without much difficulty, giving the orange and white their first NCAA win since 1993. Next was a tougher challenge: #18 Texas A&M. 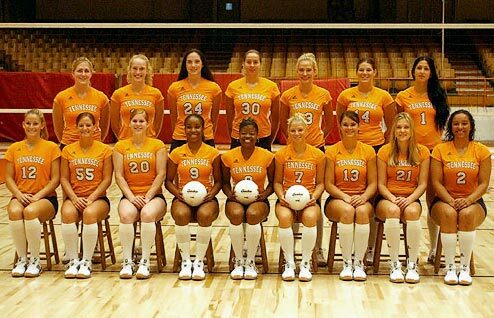 Not only were they a ranked team, but the Lady Vols had never won two matches in an NCAA Tournament. The Aggies came out strong, leading most of the first half of the first set. But UT came back and won handily 30-21. The second set was a back and forth battle, eventually reaching a 19-19 stalemate before A&M took the momentum and went on an 11-5 run. Tennessee looked to have the third set in hand, leading 28-16. But once again the Aggies went on a tear with a 7-1 run before a service error gave Tennessee the 30-23 win. The fourth set was another back and forth affair with neither team leading by more than two most of the way. The Lady Vols were able to fight off two set points before getting the final three points to win 32-30 and take the match. Tennessee was heading to the Sweet Sixteen for the first time since the tournament had expanded to 64 teams (They previous played in the regional semifinals in 1982, 1983, and 1984 when the tournament only consisted of 28 teams.) The team had won 14 matches in a row, their longest streak since 1980. They were now #9 in the nation. The squad had won 6 matches vs ranked teams so far, after only winning 9 such matches in the 22 years previous. Kristen Andre, Julie Knytych, Amy Morris, and Michelle Piantadosi were named All-South Region players. Yuliya Stoyanova was named the South Region Freshman of the Year. And coach Patrick was named the South Region Coach of the Year. Next up for the team was a Sweet Sixteen match vs #7 Ohio State. Tennessee jumped out to an early 5-1 lead but State came back to take over 14-10. After than the teams battled to a 29-29 tie before two UT aces sealed the set. The Lady Vols stormed out to a 17-10 lead in the second set, before the Buckeyes went on a 10-3 run to tie the set 20-20. But The Lady Vols would fight back for the 30-27 win. Down 2-0 heading into the locker room for the intermission, Ohio State’s coach must have had one heck of a speech as they came back and dominated the third set 30-16. OSU roared out to a 7-1 lead in the fourth set, but UT fought back and kept it close the last half of the match before falling 30-26. In the last and deciding set Ohio State again took an early lead, 10-6. But the Lady Vols won the next four in a row to tie. Unfortunately, the run didn’t last and OSU would go on to win the set 15-12. Tennessee’s extraordinary season ended in the Sweet Sixteen. Their 32 wins were the most since 1981. Their 3 losses were the fewest in school history to this day. Their .914 winning percentage is still the program record. Their #10 final ranking was the best they’d ever ended at to that point. Julie Knytych was named a third team All-American, while Michelle Piantadosi, Kristen Andre, and Amy Morris earned honorable mention — the first All-American honors for a Lady Vol since 1984. And Rob Patrick was named the CVU.com National Coach of the Year.